This bold new cruiser from Harley-Davidson presents an assertive profile that’s muscular, athletic and technical. Its thrill-seeking attitude calls to drag bike and road racers alike. The tenth new model in the Softail family, the FXDR™ 114 combines the unrelenting power of the Milwaukee-Eight 114 engine and dynamic capability of the Softail chassis. When we designed the FXDR 114 motorcycle, our focus was on weight-reduction. This new model offers several alloy and composite components to help reduce its overall weight and improve every aspect of performance including acceleration, braking and handling. • An aluminum swingarm achieves a 43 percent weight reduction (10.2 lbs./4.6 kg) from the steel Softail wide swingarm (accommodating a 240mm rear tire). 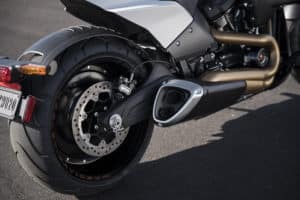 Because the swingarm represents unsprung weight (weight located below the suspension) the aluminum component has a significant impact on rear suspension performance. • The seat and composite tail section are supported by a sub-frame of welded aluminum tubing. This replaces a steel subframe, steel rear fender and aluminum fender support, for a weight savings of about seven pounds (3.1 kg). • Front and rear fenders are made of lightweight composite material. The Ace front wheel is a new light-weight design of forged aluminum with very thin spokes. Another reduction in unsprung weight that enhances front suspension performance. • The aluminum disc rear wheel is also lighter resulting in another reduction in unsprung weight that enhances front suspension performance. A Heavy Breather air intake, a fresh interpretation of the exposed, forward-facing filter element, is inspired by Screamin’ Eagle NHRA drag bikes and shaped to enhance air flow to the engine. A dramatic 2-in-1 exhaust with looped rear header pipe, burnished exhaust shield coating and beveled muffler shape with dual outlet tips, is shaped to not interfere with lean angle. The blacked-out engine with bright pushrod tubes and highlighted cylinder fins add to the performance look and help the dramatic exhaust stand out. The stretched fuel tank is exclusive in this Softail platform and lengthens the profile of the bike. Fuel capacity is 4.4 gallons. Aluminum clip-on style handlebars clamp directly to the fork tubes to complete the dragster look. The FXDR 114 delivers supreme performance with handling to inspire aggressive riders. The inverted design of the race-style front forks stiffens the front end for improved response to steering input. Single-cartridge internal technology responds quickly, and the high-performance Michelin® Scorcher II 120mm front tire stays planted for improved braking and handling performance. The mono-shock rear suspension is a single coil-over shock with emulsion technology and optimized angle between the frame and swingarm for enhanced travel and response. Equipped with external hydraulic pre-load adjustment to allow rider to maintain optimal suspension performance for prevailing load and condition. A strong braking performance of the dual front disc brakes with less lever effort inspires rider confidence. A digital riser gauge for a clean and modern cockpit. 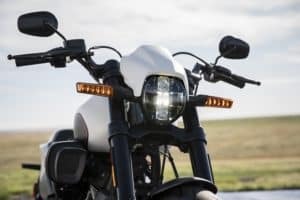 LED lighting including Daymaker LED headlamp with LED signature halo, LED rear lighting and LED turn signals make the motorcycle more conspicuous in traffic, offer optimal lighting performance and reinforce contemporary styling. 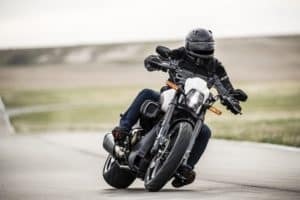 Pricing on the new model ranges from $21,349 U.S. MRSP for Vivid Black to $21,749 U.S. MRSP for denim color options, including: Black Denim, Industrial Gray Denim, Wicked Red Denim, Bonneville Salt Denim and Rawhide Denim. The all-out performance of the new 2019 Harley-Davidson FXDR™ 114 model sets the pace for a line of Harley-Davidson motorcycles, accessories and gear that deliver fresh style, thrilling performance and advanced technology. New Boom!™ Box GTS infotainment system: Available for select Harley-Davidson Touring and Trike motorcycles, including the 2019 CVO™ models, this infotainment system offers the look, feel and function of the latest mobile devices and tablets, with durability and features designed specifically for motorcycling. Harley-Davidson Touring and Trike Models: Eight 2019 Harley-Davidson Touring and Trike motorcycles feature technology advancements that elevate performance, function and style. 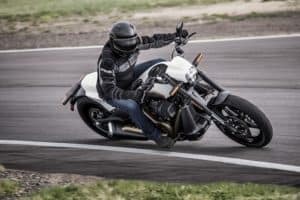 In addition, the all-new Reflex™ Linked Brake system for 2019 Harley-Davidson three-wheeled motorcycles incorporates Antilock Braking System (ABS), Traction Control System (TCS) and an electronically linked front and rear braking system, features that work together to inspire greater rider confidence. 2019 Limited-Edition CVO™ models: Three limited-production 2019 Harley-Davidson Custom Vehicle Operations™ models offer show-stopping finishes, advanced technology, exclusive components and extreme attention to finish detail. The high-performance Milwaukee-Eight 117 engine is exclusive to CVO models. 2019 CVO™ Street Glide : An edgy custom-bagger with hot-rod performance and a mind-blowing premium audio system. 2019 CVO™ Road Glide : Distinctive, menacing style combined with long-haul comfort in a performance touring motorcycle ready for long roads and late nights. 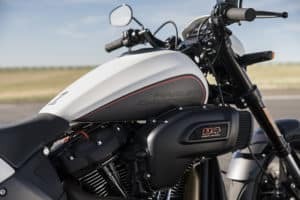 Harley-Davidson Genuine Parts & Accessories: Developed alongside new motorcycles to ensure that all customization options are backed by the highest fit, finish, testing and OEM standards, Harley-Davidson Genuine Motor Accessories offer unlimited customization options. Highlights for 2019 include: new Dominion™ collection, 7-inch Daymaker Adaptive LED headlamp, and Screamin’ Eagle Stage upgrade accessories. New FXRG Collection: Created for touring and urban riding environments, the new FXRG Collection was created for passionate motorcycle riders who demand a riding system with a combination of road-tested designs for customizable head-to-toe comfort and versatility in any riding environment. Highlights of the collection include three new FXRG helmets and waterproof FXRG Dual Chamber Gauntlet gloves. The new Boom!™ Box GTS infotainment system is an evolved interface experience for riders of select Touring and Trike model motorcycles. 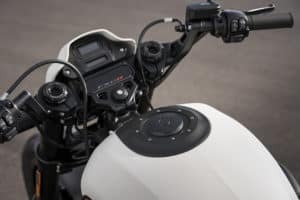 Every element has been optimized to enhance the rider’s interaction with the motorcycle and connectivity with the world to ultimately improve the Touring experience. The 6.5-inch GTS touchscreen is the same size as the 6.5GT Touch-screen but all mechanical buttons and the plastic bezel are eliminated and replaced with glass from edge to edge and the sleek, modern appearance of the latest tablet devices and premium automotive and marine displays. The new Touch-Screen Display uses Corning Gorilla Glass, used on billions of mobile devices worldwide, a durable and scratch resistant cover glass. It includes an advanced surface treatment designed to minimize reflection and give you exceptional visibility in bright sunlight. Compared to 6.5GT the new TFT display has 100 percent more resolution (from 400 x 240 to 800 x 480) with a four-times higher contrast ratio – it looks crisp and modern and is easy to view in bright sunlight. Like a smart phone, the navigation engine display responds to two-finger gestures: swipe, pinch, and drag. The Boom! Box GTS replaces the Boom! 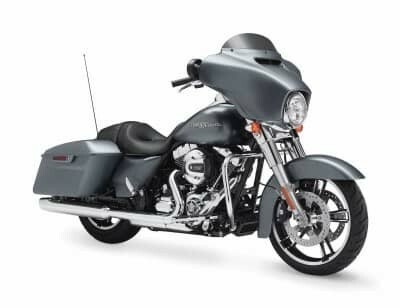 Box 6.5GT system on 2019 Harley-Davidson Ultra Limited, Ultra Limited Low, Road Glide Ultra, Road Glide Special, Street Glide Special, CVO™ Limited, CVO™ Street Glide , CVO™ Road Glide and Tri Glide Ultra models. The new Boom! Box GTS processes faster, has more memory and is more responsive than the previous Boom! infotainment systems. 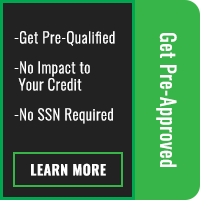 Start-up time is reduced from 21 seconds to 10 seconds, and the time to FM Audio is less than 6 seconds, while route calculation time is reduced from 10 seconds to 2.5 seconds. The home screen display is reduced to three key system buttons: Navigation, Phone, and Music. A new Back button has been added to the right-hand control. Other screens (Nav, Phone, Music) feature condensed information that’s easier to read and navigate. And the new Quick Jump feature allows easy access to NAV, Audio and Vehicle information. The entire GTS system can be managed with the motorcycle hand controls. The Boom! Box GTS also has a new navigation engine with a voice recognition enabled “one box search” function (like a search engine). The navigation engine allows customers to choose alternative routes based on fastest, shortest, twisty and scenic NAV features. Boom! Box GTS is Apple CarPlay compatible* and can project phone functions to the screen, including streaming apps, weather, traffic, etc., so the rider can enjoy and use those functions that have been installed on a phone. Base system audio with 25 watts per channel through two or four speakers, with P&A support for up to three sets of Boom! Stage II speakers and 900 watts total power. Current audio sources are maintained: AM, FM, WB, XM, Bluetooth streaming and Digital Mass Storage compatibility.